The bulk modulus refers to the ratio of pressure to the decrease in volume. This is the inverse of compressibility. 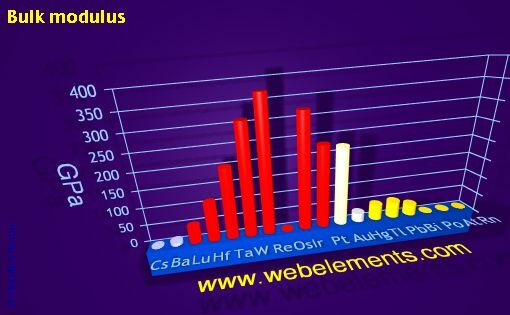 Image showing periodicity of bulk modulus for 6s, 6p, and 6d chemical elements. To convert GPa to Pa multiply by 109. Data are largely from references 1, 2, and 3. Data for the lanthanides were taken from reference 4. Some other data is in reference 5. G.W.C. Kaye and T.H. Laby in Tables of physical and chemical constants, Longman, London, UK, 15th edition, 1993. G.V. Samsonov (Ed.) in Handbook of the physicochemical properties of the elements, IFI-Plenum, New York, USA, 1968. H. Ellis (Ed.) in Nuffield Advanced Science Book of Data, Longman, London, UK, 1972.